Most companies wouldn’t make a point of highlighting how slowly they’ve innovated over the last 75 years, but Jeep isn’t like most companies. To mark the 75th anniversary of Willys-Overland signing the military contract to build Jeeps for World War II, current Jeep parent Fiat Chrysler Automobiles built in Toledo a special, single version of the Jeep Wrangler that looks strikingly similar to an original Willys MB. The vehicle was met with cheers Friday after rolling off the assembly line at Fiat Chrysler’s Toledo Assembly Complex and being promptly parked next to an original WWII Willys. To be fair, there are major differences between the 60-horsepower 1941 Willys MB and the 285-horsepower 2016 Jeep Wrangler. The WWII-era Jeep was doing good to hit 60 mph, didn’t have any kind of seat belts, sounded like a tractor, and lacked certain creature comforts, such as doors. Still, put them side by side and there’s no question that Jeep has stayed true to its roots, even as the years and owners passed. The build took about five hours to complete. The Wrangler 75th Salute, the only such vehicle the company will make, started life as a regular Sport model that got a special coat of olive drab paint. Workers at the plant threw out the doors, chopped off the roll cage, installed special seat coverings, bumpers from the Jeep J-8 export model, and 32-inch military nondirectional tires on steel rims. There also were other smaller touches, such as 419 stenciled on the bumper and Friday’s date stenciled on the hood in place of an Army vehicle identification number. Plant Manager Chuck Padden said the company’s design office came up with the idea after plant officials had begun thinking about ways to celebrate the 75th anniversary. It took a few weeks of planning to prepare the line to build a one-of-one vehicle, but it all came together flawlessly. Toledo-based Willys-Overland built 370,000 Jeeps for the military during World War II. The firm quickly shifted to civilian production as the war drew down. In the decades since, millions of Jeeps have been sold across the world. The Toledo Assembly Complex built about 530,000 Jeeps last year. Fiat Chrysler intends to keep the one-of-one Wrangler for special events, likely to include the Toledo Jeep Fest on Aug. 13, a public celebration of the 75th anniversary of the Jeep brand set in downtown Toledo. 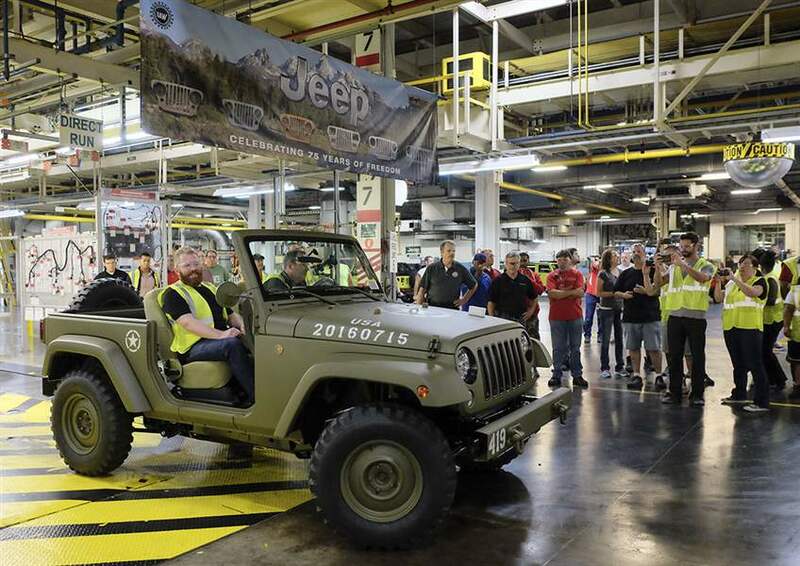 For Mr. Allen, a longtime Jeep employee, the project was one of special indulgence — especially the fact that it was built in Toledo. Contact Tyrel Linkhorn at tlinkhorn@theblade.com or 419-724-6134. With nearly 20 years under its belt and almost six in its current, third generation, the Dodge Durango remains a rugged-looking contender amid today’s often minivan-like crossover SUV crowd. My recent SXT AWD Blacktop tester appeared even more masculine than the model’s usual chrome-clad design. Its grey Billet Metallic paint and body-coloured detailing along with its blacked-out grille, headlight and fog lamp bezels, mirror caps, wheels and badging made it look as intimidating as a highway patrol ghost car, although the constabulary doesn’t normally spend the money required for 20” rims on 265/50 rubber. Still, this Durango’s only a couple of blue and red strobes away from striking fear into the hearts of surrounding motorists. Believe it or not, I’m describing a base 2016 Dodge Durango SXT with $195 in paint and $1,595 for the Blacktop package, which also adds cool LED daytime running lamps and a dual exhaust while subtracting the roof rails. This, combined with a complete lack of chrome as well as a rich leather and pseudo suede cabin, endows the vehicle with a decidedly upscale, urbanite attitude. My tester also included the $1,250 Popular Equipment Group encompassing heated front seats and a heated steering wheel, a back-up camera, and rear parking assist. The standard features menu is equally impressive thanks to auto on/off headlamps, proximity access with push-button ignition, LED interior lighting, illuminated cup holders, an auto-dimming rear-view mirror, power heated side mirrors, a leather-wrapped, multi-function steering wheel, cruise control, a multi-information display, tri-zone automatic HVAC with rear controls, a Uconnect colour infotainment touchscreen, outstanding audio with satellite radio, a comfortable 8-way power driver’s seat and 4-way power front passenger’s seat (which also folds forward for extra convenience), a 60/40-split second row, a 50/50-split third row, and more. Meanwhile, the 2016 Dodge Durango’s standard safety kit includes trailer sway control, hill start assist, active head restraints, and all the usual active and passive safety equipment. All of this comes in a cabin that will make you completely forget any previous Durango interior thanks to soft-touch surfaces like the dash top and halfway down the instrument panel, and even the lower extremities of the centre stack. Stylish, satin-silver inlays highlight the dash and door panels, while the thickly padded leatherette armrests boast contrasting grey stitching to match the seats. Likewise, the leather-wrapped steering wheel is padded and nicely stitched for extra grip, while the switchgear on its spokes and elsewhere around the cabin is well damped and has a high-quality feel and tight fit. The premium-level 7” colour TFT gauge cluster behind said steering wheel in the 2016 Dodge Durango SXT AWD Blacktop immediately catches the eye, replete with a myriad of features and bright, clear legibility no matter the light outside. However, this advanced bit of electronic kit makes the entry-level Durango’s most glaring weakness all the more apparent ― a centre stack that comes across as more rudimentary than the majority of competitors due to an infotainment touchscreen that measures a mere 5” diagonal. I’ve also tested the Durango with its available 8.4” touchscreen and let me tell you it’s a wholly different experience that I recommend if your budget allows (because you’ll need to move up in trims to get it). The aforementioned rear-view camera incorporates active guidelines, while the audio system includes Bluetooth streaming and easy phone connectivity. A simple digital compass points the way instead of navigation, however. Unusual is a digital button that will automatically drop the third-row headrests for better rearward visibility. 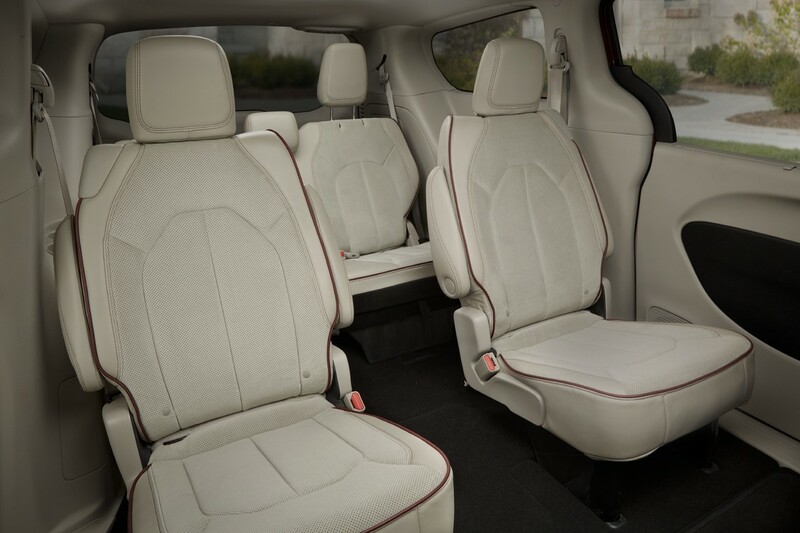 Most should find the 2016 Dodge Durango quite spacious. It’s an SUV bordering on full-size dimensions, although not quite as big as a Chevy Tahoe or Ford Expedition, at least when it comes to width, but second-row passengers get plenty of legroom. That middle bench (bucket seats are available) folds out of the way for easy access to a third row that’s nicely finished and amply sized for normal adults. Alternatively, the rearmost bench can be left folded into the floor for additional stowage room, expanding the reasonable 487L cargo hold (about the size of a large sedan’s trunk) to 1,351 litres behind the second row. When both rear rows are folded, the Durango is one of the most accommodating SUVs in its class with a massive 2,393 litres of cargo space. While this Dodge Durango SXT doesn’t quite meet premium-level expectations inside, the hefty thunk its doors make when closing, its overall quietness at speed, and the impressive way it takes to the road will make you wonder why the company doesn’t go all the way with luxury refinements. It’s a unibody design, in case you weren’t aware, so the Durango is no longer riding atop a pickup truck frame like it used to (and some of its aforementioned full-size colleagues still do). That’s why its structural rigidity is so sound, overall feel so substantive, and handling so agile ― similar to pricier SUV players from upmarket brands. The 2016 Dodge Durango’s fully independent suspension provides a wonderfully compliant ride and confidence-inspiring road holding, while its advanced 8-speed automatic transmission wows with a space-saving, rotating-dial gear selector. Fully engaging paddle shifters help make the most of the 3.6L Pentastar V6’s 295 horsepower and 260 lb-ft of torque. These numbers aren’t class-leading, but takeoff feels more than strong enough. Meanwhile, the big brute surprisingly achieves the best fuel economy in its AWD class at 12.8L/100km city and 9.5L/100km highway, this due in part to auto stop/start technology that comes into play when the engine would otherwise be idling. The V6 runs smoothly, too, although it makes a wonderfully gritty growl at full throttle. The autobox is similarly smooth, yet capable of quick, crisp shifts when pushed hard. Furthermore, the available Sport mode is actually quite aggressive, requiring the use of those paddles so as not to rev the engine too high and needlessly waste fuel. At the end of my test week, I only had one complaint that also has affected a number of other FCA vehicles equipped with proximity-sensing access ― a regular need to press the door handle-mounted button multiple times to gain entry. I found that shifting my body position sometimes helped, no doubt relative to which pocket held the key, but seeing that I haven’t needed to do likewise with the passive entry systems used by other automakers, it may be something FCA should look into. This small irritant aside, the 2016 Dodge Durango is an impressive SUV that still measures up to more recently updated competitors in most respects. The larger infotainment display and rear-view camera should be standard, though, especially considering the base price of $43,395 plus freight and dealer fees. Dodge preferred to invest its money into one of the best drivetrains in the industry. While as smooth and refined as anything in its class, you’ll be hard-pressed to find a tougher-looking SUV, which seems fitting considering it hails from a brand that also purveys the badass Charger and the even more alluring Challenger, not to mention the now-legendary Viper. Even with its pint-sized infotainment screen, I couldn’t help liking it, but if my money were on the line I’d upgrade to get the more advanced system. It’s your call, but either way you’ll be well served with a Dodge Durango. Since the introduction of the original Dodge Caravan in 1984, Chrysler has ruled the minivan roost. 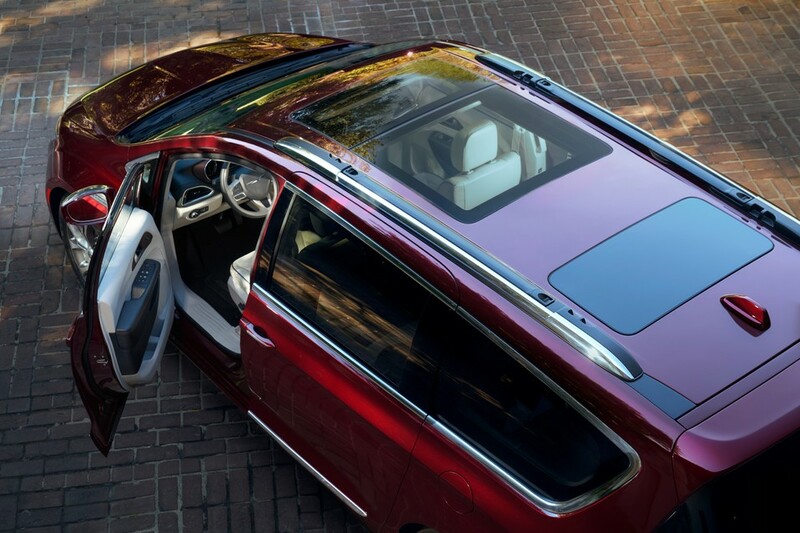 The latest expression of the company’s take on the ultimate people mover is the new Pacifica. It started with a clean computer screen, so just about every facet is new or has been reworked for the better. The one thing that does not change, however, is the utility and flexibility engineered into the cabin. Up front, the Pacifica features top-shelf materials and supportive Nappa leather-wrapped seats — a 1,000-kilometre trip did not produce the dreaded numb-bum. Then there’s the attention to detail, found in the likes of the French stitching on the instrument panel and, of all things, the mat that finishes the lower storage area; it has four generations of minivan neatly embossed into the liner. 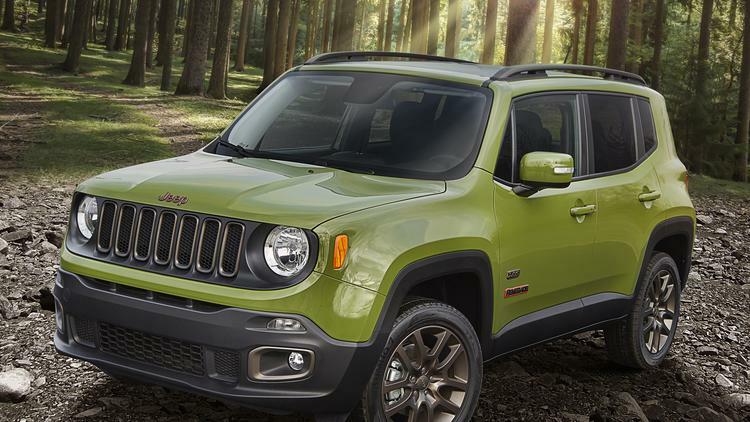 This Easter egg thing is rapidly becoming a Chrysler trait; look at the base of the Renegade’s windshield and there sits a pictogram of the original Jeep. The Limited tester arrived as loaded as loaded gets, with everything from heated/cooled front seats and an oversized panoramic moonroof to all of the latest gizmos including Chrysler’s Uconnect infotainment system and its 8.4-inch touchscreen. This system remains the easiest of its ilk to use; for example, pairing a phone was so simple my 11-year-old daughter accomplished the feat in seconds and without having to refer to the owner’s manual. So far it’s all eminently logical. That is, until you get to the buttons for the park assist, lane departure warning and stability control systems. When the light in the switch is illuminated, the system is turned off. That’s backwards — the A/C button illuminates when the system is keeping an oppressive summer day at bay, which is as it should be! Move rearward and things are just as swanky. There’s seating for up to eight passengers, no fewer than 243 seating configurations (or so says Chrysler!) and a ton of space. With all the seats in place, there’s 915 litres behind the third row – enough for five golfers and their clubs with room to spare. Power the third row down and the capacity jumps to 2,478 litres; drop the middle Stow ’n Go row seats and there’s a cavernous 3,979 litres. The plus is the seats are always ready to go when needed. In many cases, one or more of a typical minivan’s seats is gathering dust in the garage and not available for use after schlepping half a house’s worth of stuff to university. This is the one area where Chrysler’s minivans have no peer. One of the cool features proved to be the middle-row entertainment system with touch-sensitive screens. The system not only plays movies, it includes some built-in games and the “Are We There Yet?” app; when the driver punches a destination into the navigation system, the app shows the distance to go and estimated time of arrival, which dispenses with that age-old question. 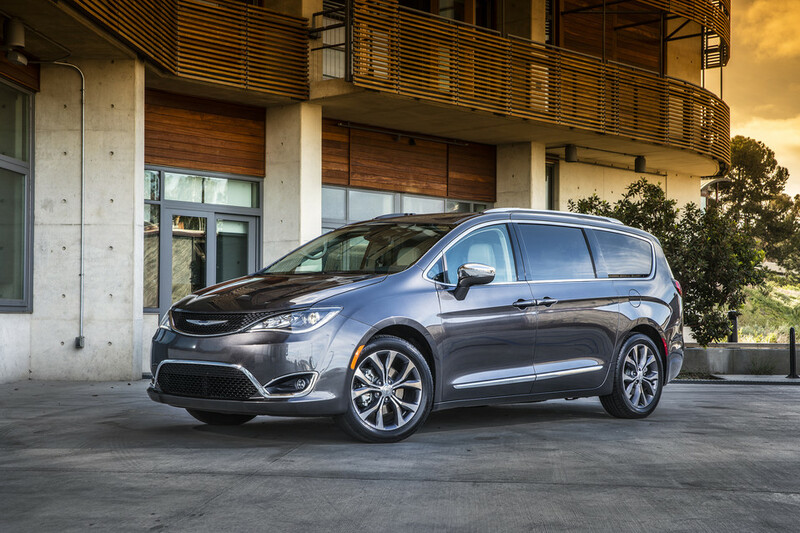 The Pacifica arrives with Chrysler’s 3.6-litre Pentastar V6, putting out 287 horsepower and 262 lb.-ft. of torque, which delivers sprightly performance — it canters to 100 km/h in eight seconds and can tow 1,633 kilograms when properly equipped. The power is fed through the front wheels via a nine-speed automatic that shifts smoothly and, unlike some, manages to find the right gear at the right time. The unspoken plus proved to be fuel economy. Over that 1,000-km test, the Pacifica returned an average of 10.8 L/100 km, which given the size and capability came as a complete and very pleasant surprise. Now if you are really into fuel economy, the Hybrid model uses the same engine, an electric motor and a 16-kWh lithium-ion battery to improve that number even more — it offers up to 48 km of electric-only driving. Equally impressive was the manner in which the Pacifica balanced the need for comfort with the desire for handling. No, it is not a sports car by any means, but the suspension is quick to take a set in a corner and the steering delivers better-than-average feel and feedback. Likewise, understeer is moot for the most part thanks to the optional P245/50R20 tires; they deliver a ton of grip, although the perky nature of the engine does see them chirp on a fast take-off. Hit the highway, and the kilometres waft away in a very comfortable fashion. It’s a nicely balanced set-up given the fact it has to deal with just the driver much of the time, but with the capacity to transport a van-load of sumo wrestlers.